2018 Update: The Paugussett has grown! 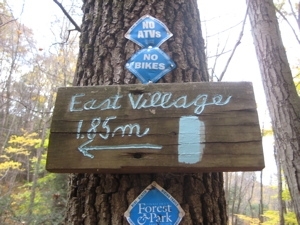 Yes, a fairly substantial extension has been added on from the 2008 southern terminus, bringing the trail to a length of over 14 miles. 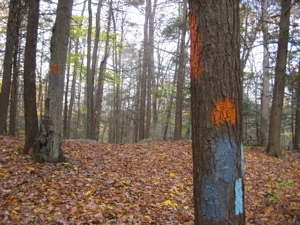 Additionally, there have been several reroutes and side trails added on (which may be parts of the old 2008 Paugusett. At any rate, while the spirit of the trail is as it reads below, this page demands either a rewrite or a link to updates… whenever I get out to Shelton to hike the new stuff. I wasn’t about to let a perfect Fall day go to waste. My parents were up for the weekend so I used the opportunity for a car spot in a place I’d have trouble getting one otherwise. I pretty much chose the Paugussett based solely upon this criteria; that is, get as far away from my house as possible, an end-to-end trail, and don’t screw up my parents’ drive home to Delaware too badly. Mission accomplished. Of course, my dad now drives slower than he used to and he questioned my navigation skills to get us through the rural backcountry roads, but it all worked out fine. 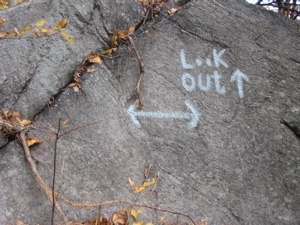 Well, except for finding the trailhead off of Indian Well Road. The trail starts “immediately after crossing stone wall bridge.” This is absolutely true and seems pretty straightforward, but a) the first blaze is a bit hidden, b) there is no signage, and c) there are a few stone wall bridges. 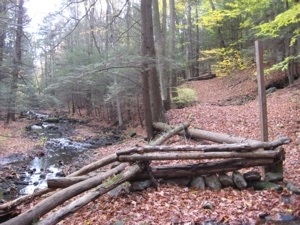 This is where the trail started in 2008. None of this is accurate in 2018 onward. The Paugussetts were American Indians who occupied mainly what is now Derby, Connecticut (our smallest town, by the way). 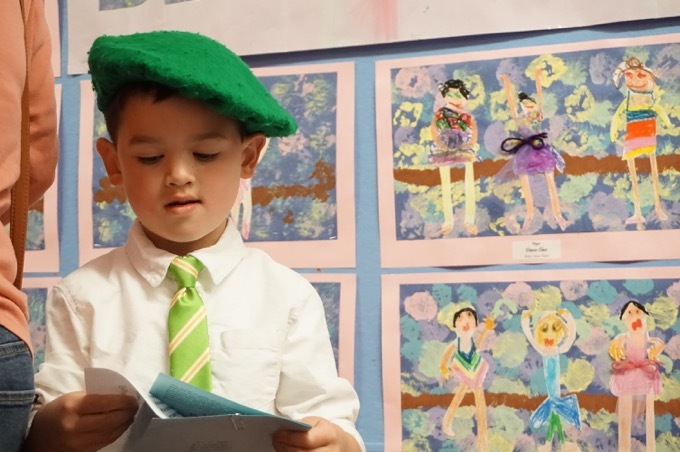 The word “Paugussett” literally translated means “where the river widens out.” Reservations were set up for the Indians soon after the colonists arrived. 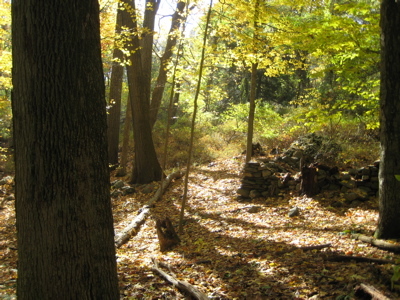 In 1659, the General Court in Fairfield ruled that 80 acres of land should be held for the Paugussett Indians at Golden Hill – named after the corn grown on the hill – located in Bridgeport. 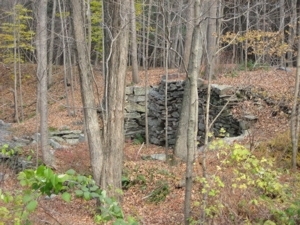 Over time, however, the tribe was forced to sell off its land to succeeding generations of New Englanders who inhabited the area. Today, only one log cabin on one-quarter of an acre of land remains there. It is said to be the smallest Indian reservation in the US. 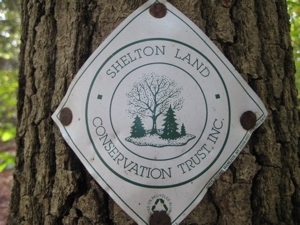 I doubled back and passed the side trails for the Shelton Open Space land, then passed the access trail I took earlier, and then entered a stunning and surprising grove of massive tulip trees. By far the biggest I can remember ever seeing; and there are a lot of them. 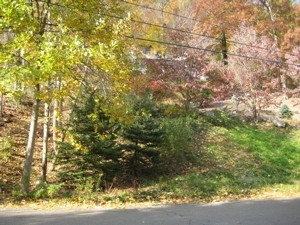 For a short spell here, through the tulips and beeches, I was struck by just how pretty a New England Autumn day in the woods can be… It was all right there in front of me – the yellow leaves, the centuries-old stone walls, the quiet rustle of nothing more than the wind and a distant squirrel. Yeah, this is why I do this. I really think this could have been a good picture by someone with a good camera who knew what he was doing. 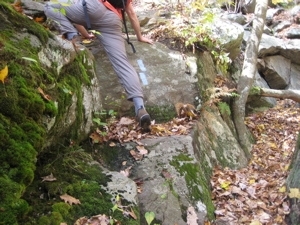 The trail entered some much rockier terrain as the hillside become steeper. While the trail does contour the hillside pretty well, I was surprised by the technicality needed to safely traverse this section. Anyone can do it, but I was really motoring along and was caught off guard by the rocks. I have some photographic proof of what I’m talking about. 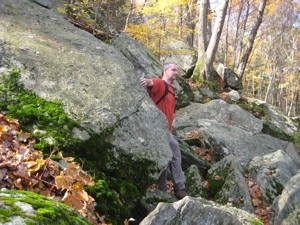 Of course, this section is only maybe a third of a mile long and it’s more fun than anything else – just be prepared for it, especially if you’ll be hiking on the dreaded wet leaves. I took a swig of water, turned around, and descended rapidly back down to the Paugussett. Sigh. CFPA side trails to viewpoints are like really hot women who flirt with you saying all the right things… and then just when everything is perfect, you realize she’s totally not into you. This also meant I was leaving the confines of Indian Well State Park. According to legend, a waterfall at the park was the secret meeting place for two lovers from enemy Indian tribes. When their tryst was discovered, the father of the Princess, a Paugussett chief, ordered a raid upon the Pootatuck village where the brave lived. The Princess believed her lover was dead, and in despair dove off the waterfall. Her brave, who had survived and was sleeping nearby, awoke to the sound of her suicide. Then he too jumped off the waterfall to join her in eternity. The pool was once much deeper than it is today and was believed to be bottomless. 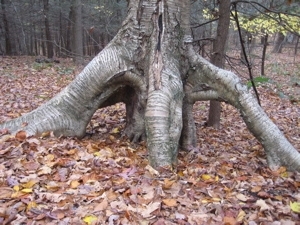 This legend seems rather pervasive with various tribes in Connecticut. Just upriver there is a similar tale along the Lillinonah Trail, we have a Lover’s Leap State Park too, and don’t forget Yantic Falls down in Norwich with a similar legend. Rant: This third of a mile bit through these woods seems completely unnecessary. I realize we want to stick to the woods as much as possible and I appreciate that. But in this case, it really makes no sense. 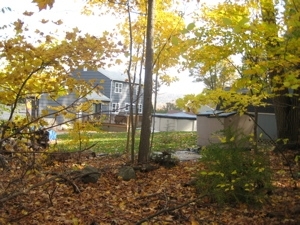 The trail climbs straight up in between two houses, then takes a sharp right-hand turn to squeeze through what I assume is a 10 foot easement corridor. You can easily peer into the windows of the houses below as the occupants of the houses above peer at you doing so. 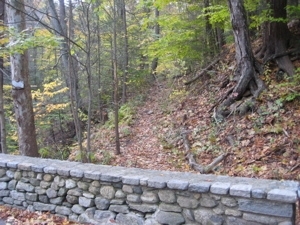 The grade is very steep and before popping out onto another road again, the trail pretty much skirts some fencing through a few backyards. Meanwhile, the road the trail takes here is the same road we just crossed before that steep climb. This may be the only time I ever say this but, the trail would be better served to just stay on the road for this small stretch. 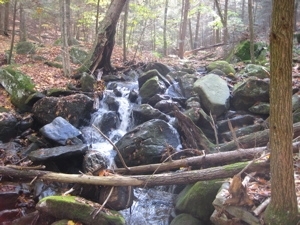 After the few minutes on the road (Thoreau Drive extends further than the Walkbook shows), the trail again ambles right next to a driveway and then steeply down this time, down some steps towards Round Hill Brook. 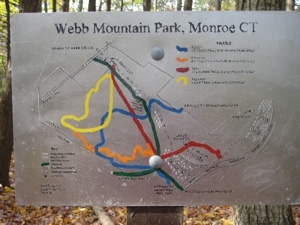 After crossing the brook and now entering the town of Monroe, the trail enters Webb Mountain park. 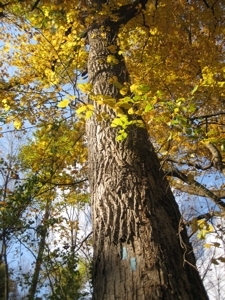 The Town of Monroe purchased Webb Mountain Park in 1972 from Mr. And Mrs. Alfred E. Wagner. 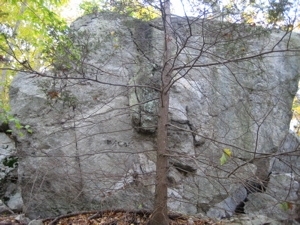 The park has many unique features from when the Wagner family owned the land. 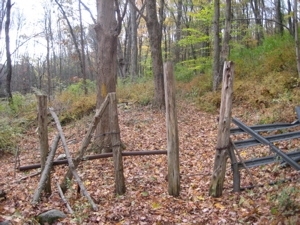 The Wagners built and ran a sawmill on the land for three years. They also owned a Christmas tree farm and planted several varieties of evergreens, such as Balsam, Frasier and Douglas firs, White and Blue Spruce, and Scotch and White Pine. 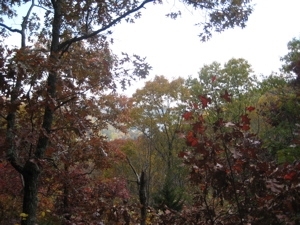 These evergreen plots have overgrown and are now the campsites of Webb Mountain Park. And don’t forget about the Webb Mountain Discovery Zone here as well – a place I’ll get to someday. But that didn’t take away from my enjoyment. 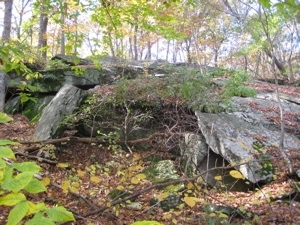 It’s a pretty area with some interesting rock features and supposed views of Lake Zoar – which is a wide area of the Housatonic River. I climbed up something called the 100-foot ledge which was cool and then descended the backside down to a power line cut, then an old gravel road along another brook. 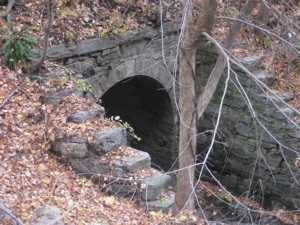 The trail then pops out onto some railroad tracks, passes a very old stone archway bridge along Cottage Street. I meant to remember the name of the company on the arch, but I’ve forgotten. It was Kelley Brothers or something from 1888 or thereabouts. Sorry for the oversight on my part. From this point on, the trail takes on a very different feel. It turns southwest and follows Boys Halfway Brook almost straight as an arrow, slightly uphill, the final three miles to the Monroe end. The whole way is very pretty which a bunch of old stone walls, old (and still used) pasture gates, several mill races, and a weird little section of winged euonymous bushes. Apparently along this stretch I missed a Satan in Connecticut opportunity. 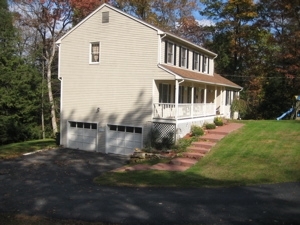 From the 1968 version of “Short Walks in Connecticut, “Cottage St. 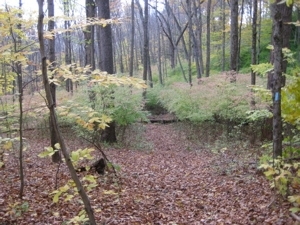 Trail follows cart path through hemlock grove then parallels the west bank of Boys Halfway River. 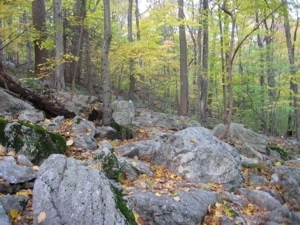 After crossing river continue on trail southwest to Devil’s Den. 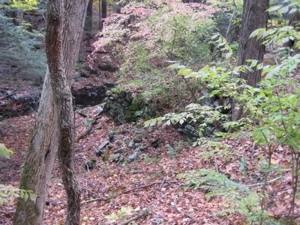 Trail leads to Barn Hill Rd.” The hemlock is pretty much dead, the trail has a different name (and is half the distance), and the trail doesn’t cross the brook until very near the road… and it no longer passes this Devil’s Den. Which really stinks. 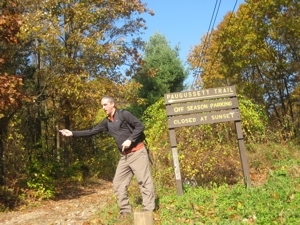 One road crossing and then a short stint back through some white pine and 9+ miles later, the Paugussett was complete! I hear tell there is talk of lengthening the trail at some point in the nearish future, so I’ll have to keep updated on that. Nice blog! 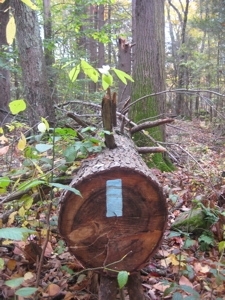 I’ve been finding and planting letterboxes along the blue trails, and was looking for more info on the Monroe section of the trail, which I haven’t been on in a long, long time. Looks like some good places to hide boxes, there, I just need to find out which areas are public land. The unknown leaves look like Sycamore to me. I can’t see the questioned shrubs too well, but I think they might be winged euonymous, an invasive species. I have a question about the Paugussett Trail. I have been trying to walk it slowly but confused as to where it is. 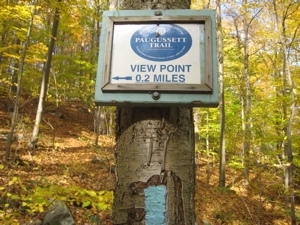 I just did the Paugussett Trail three weeks ago. It is now about 14 miles. It was the first time I did anything over 9 miles. I loved it! I grew up in the area, so I’m a bit biased. It was weird and cool to see places from my childhood, like the 34 bridge from Oxford to Monroe that used to scare me as a kid, largely due to scary drives over the old grated Sikorsky Bridge. It’s a nice hike. The boulder scramble you talked about completely caught me off guard. I started in Meriden, so I had to go down it with my 40b bag. 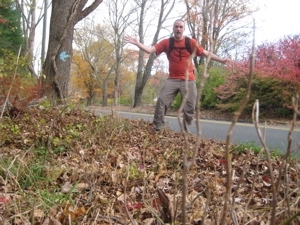 That part was pretty intense with all the slippery leaves for the first few minutes, after I started to get used to it. Other than some reroutes and a small extension, the biggest change since you hike it has been the extension further into Shelton. You cross 111 and go up hill into a dog park, the backyard of a couple of residencies, and then the first of two or three pylon fields. 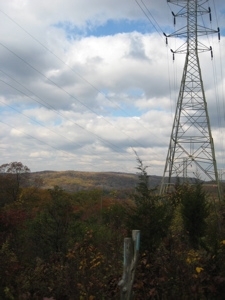 I didn’t expect walking along power lines so many times. There is one point were you go under one! There’s also a nice stroll next to a reservoir and a super short walk through a native plant reservation, which was a nice surprise. It is also cool to see a bunch of people towards the end of the trail walking with others, their dogs, or trail running along the intersecting trails. I like seeing trails used by people so casually. 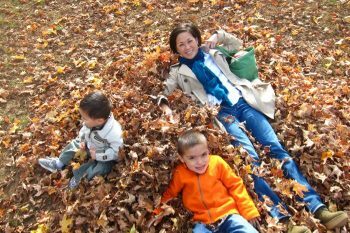 I see myself doing the trail again because it is at my doorstep, and it is relatively easy. I’m now the volunteer CFPA Trail Manager for the Paugussett from Indian Well to the Monroe Border, and we’ve been rerouting and fixing up sections of the trail over the past three years. 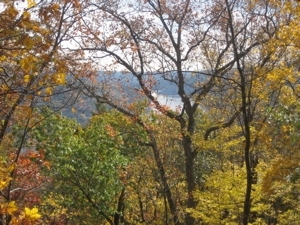 CFPA did a HUGE reroute last year near the falls and cleared out the overlook there so there’s a great view. 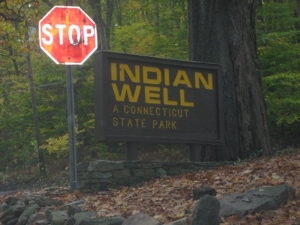 Indian Well State Park only goes about half the way to Round Hill Road. 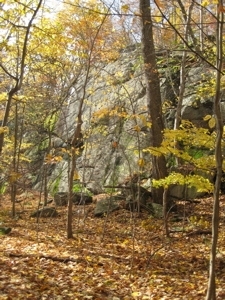 The remainder of the woods is Birchbank Mountain, city open space (“The Boulders” are not in Indian Well). Where the yellow/blue spur went up to the overlook, we rerouted the main trail to the overlook and had the Tree Warden clear the view. 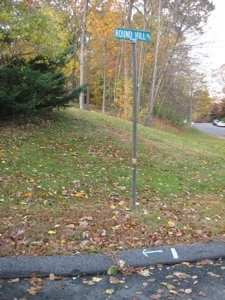 The new route then heads on to Round Hill Road/Okenuck (the sign says Round Hill for one of the streets – the other street is Okenuck). We’re now working on that Land Trust property where the trail goes straight up between houses north of Princess Wenonah Drive. 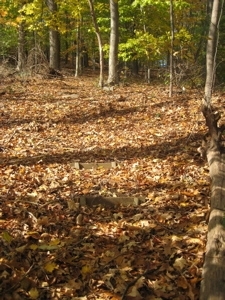 It’s now called the Poet Path and we’ve been digging the trail into the side of the hill and working on that evil ascent. There’s some new artwork along this section referencing the poets (this section of Shelton is called the Poet Section because the streets are named after poets). And more improvements are planned.